With Trump Announcing Big Cuts, Advocates Press Senator Schumer to Take Bold Action. 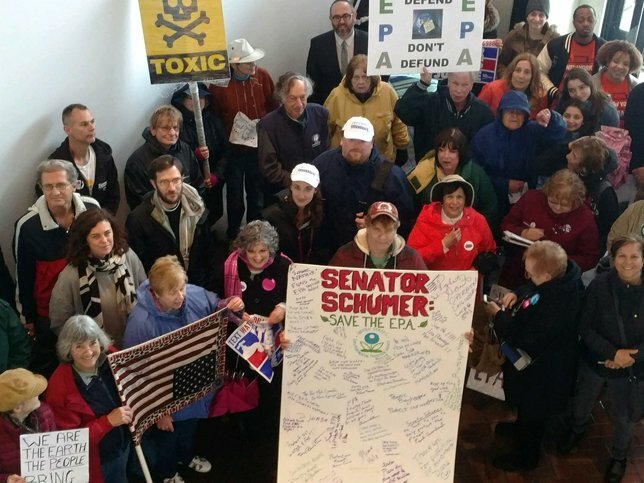 Community members and environmental activists rallied outside Senator Chuck Schumer's office to save the EPA. Melville, NY - April 25, 2017 - Dozens of community members and environmental activists rallied outside Senator Chuck Schumer's Melville office on Tuesday, calling on him to lead the Senate Democrats in resisting the White House plan to slash the budget of the Environmental Protection Agency. Donald Trump proposes to cut the EPA's budget by 31 percent, which the groups said would have serious effects on Long Island. Activists and residents at the rally said that such radical cuts would impact to Long Island communities, including the elimination of programs to combat climate change, clean up hazardous waste, and protect water quality. "We stand up with the EPA and institutions that protect our citizens from those who would destroy our environment for profit or convenience," said George Povall, Director of All Our Energy. "Business and governance models that steal a clean and livable environment from citizens and future generations, and pit their welfare against the public's, are failures, and should fall as such." “Few things are as important to Long Islanders as the EPA. Reducing funding for it is counter to what we need most, clean ups of the damage done in the past, and protection from future degradation,” said Jane Fasullo of the Sierra Club Long Island Group. "Now more than ever, we are called upon to be shomrei adama - safekeepers of the Earth. Time is running out for humanity to honor its covenantal obligation to preserve and protect our planet as a beautiful, sustainable home for all its inhabitants," said Cantor Eric Schulmiller of the Reconstructionist Synagogue of the North Shore. The noon rally was sponsored by Food & Water Watch, Sierra Club Long Island Group, Move Forward Long Island, Long Island Progressive Coalition, Long Island Clean Air Water & Soil, All Our Energy, Show Up Long Island, South Shore Audubon Society, North Shore Audubon Society, Green Party of Nassau County, Reach Out America, New York Communities for Change, Slow Food North Shore, iEat Green, Long Island Activists, Peconic Baykeeper, Surfrider Foundation. Subject: LongIsland.com - Your Name sent you Article details of "Long Island Rallies in Melville to Save the Environmental Protection Agency"